Step into an immersive exploration of Questlove’s career, influences, and contributions to art and music that is filled with significance and detail. 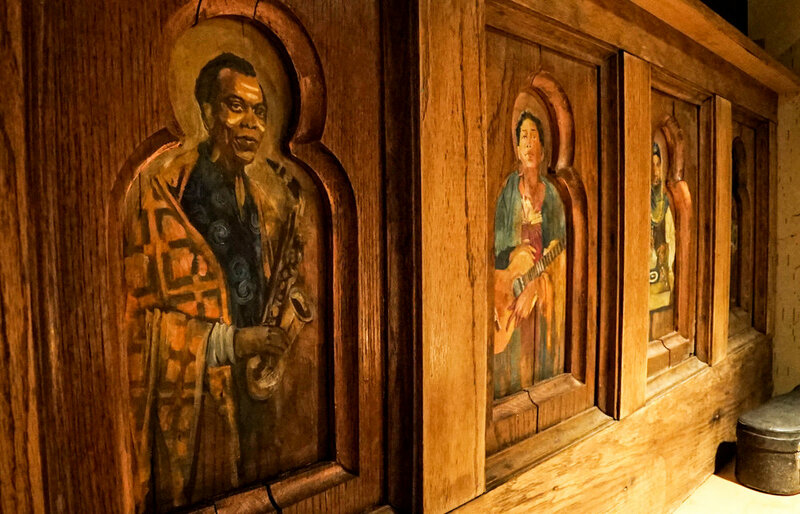 A stunning piece of salvaged church architecture frames saintly images of people who influenced and inspired Questlove. J Dilla, who Questlove has called “the greatest rap producer of all time,” is the saint of Mixology. Odetta is the saint of Spirituals. Amiri Baraka is the saint of Poetry. Late Roots manager, Richard Nichols, is the saint of Ecology and Growth, and Fela Kuti - the Godfather of Afro-Beat, is the saint of Musicianship. Each detail in the room was selected for both it’s significance and aesthetics. A vintage optometrist machine reminds us to maintain our clarity and vision, player piano scrolls become inspirational wallpaper, and a KISS coffee mug nods to Questlove’s admitted childhood “obsession” with the band, and his controversial vote for them to be admitted to the Rock and Roll Hall of Fame.